This morning was spent cleaning and tidying the apartment in preparation for tonight's romantic (but not cheesy romantic, mind) Valentine's Day meal FP and I have been planning. He was busy in the bureau cleaning his desk and I made my way to our cleaning cupboard to fetch some Mr Muscle. 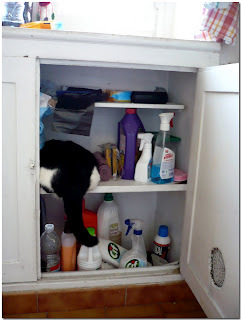 The door had been left open (as we all know by now, FP does not know how to close drawers or cupboard doors) and I reached in to grab the bottle of product when I was wacked across the chin by a wagging tail. 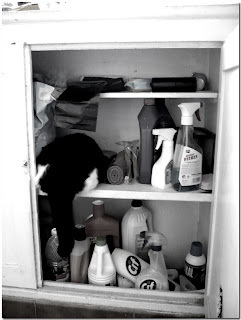 Ollie loves to get into our cleaning cupboard, which is a shame because he knows it's forbidden - all those chemicals don't mix well with cats. There is an open space in the wall inside the cupboard, covered only by a flimsy grill to let any gas out (or so I've been told...) if there is a leakage so that we don't all explode. Whenever Ollie gets a chance, he sticks his face right up against the grill and excitedly watches the birds in the neighbouring tree. He pretends to be a tiger when he watches those birds from behind the safety of that grill, but when we take him outside and he has the freedom to chase birds, he runs away from them instead. so so cute, I really miss having a cat. ollie is huge! he has grown so much! Haha! 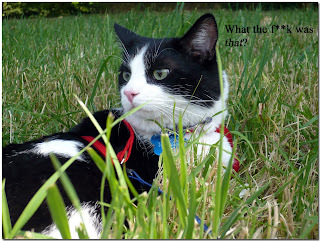 Yes, Stavroulix, he is definitely no longer a kitten!